This post provides guidance for anyone with a new Raspberry Pi that is looking for the required accessories, but also tries to dispel some of the myths that have been in the technology press and technology blogs. There have been reports in the technology press about how much extra cost there is to owning the Raspberry Pi. Whilst these may be correct in stating how much they paid for accessories these do not reflect the realities of the pupils / students that the Raspberry Pi is intended for who will have different hardware available and be a lot more resourceful than the journalists that have paid over the odds for a simple cable compared to much cheaper alternatives. Here is a run through of some of the accessories that I use with my Raspberry Pi and how little they cost, this includes most of the different permutations that I've tried using my own Raspberry Pi. I've used two different profiles to work out the costs, one is the maximum cost assuming that the user has nothing at all to start with, the other is a typical cost assuming a fairly typical school pupil. It would be possible to do this even cheaper if they have most accessories or if someone is resourceful enough to get hold of some bits that are being thrown away. One area I haven't priced is a typical school environment. I expect that schools will only be able to order from specific suppliers and so may not be able to get such good prices, but hopefully they will be able to use some of their existing parts from old computers (eg. keyboards and mice) and so would only really need a suitable video cable (eg. VGA converter or DVI cable), power supply (perhaps sharing a USB hub between multiple Pis) and SD card, which I hope should be available fairly cheaply by the time they are rolling these out to schools. I've mainly used Amazon.co.uk as that is where I bought most of my accessories from*, but ebay or local shops can be just as good or better. The power supply is a an essential item to use the Raspberry Pi. The power supply for the Raspberry Pi is a standard micro-usb charger. This is the de-facto charger for most mobile phones as well as other electronic devices. I have dozens of USB adapters in the house that are suitable. This includes laptop power supplies, my Android (HTC) phone charger, Asus tablet charger, USB hub and more. The minimum requirement is that the supply must be capable of at least 700mA. There are several chargers on Amazon starting from about £2. The details are a little sketchy for many of these devices, so I've used one that I've actually tried - which is a standard Nokia phone charger. These are available from about £6. The Raspberry Pi runs the open source Linux operating system which is available for free download. As well as not costing anything the source code for the operating system is available to allow programmers to change and improve as they wish. The operating system is stored onto an SD memory card. The minimum size for the SD card is 2GB. Whilst most will have an SD card for a digital camera, I assume that most will buy a new SD card dedicated for use on the Raspberry Pi. A 4GB SD card is available for about £3.50. I always use branded SD cards (my data is worth more than the small difference of buying unbranded cards), but I tried the standard speed SD card and some faster speed SD cards. In my tests I was not able to find any performance improvement with the more expensive card. My testing was very basic and only limited in scope. You may find that if using the SD card intensively that there is a difference, but boot times and normal performance did not appear to differ between different speed cards. The operating system needs to be transferred to an SD card. This can be done on any computer with an SD card reader. Most fairly recent computers now include this as standard. If not then the example shown costs about £3.50, although can be bought from less. Most people have a USB keyboard and mouse available either from an old computer or perhaps to use with a laptop computer. In my case I had an old computer with a spare keyboard and mouse. If not then a combined keyboard and mouse set is available for about £9 or so. You could also get a cheap keyboard or mouse from a local store. Tesco sell a keyboard and mouse separately for about £5 each. Typical cost: £0 (using existing mouse and keyboard). 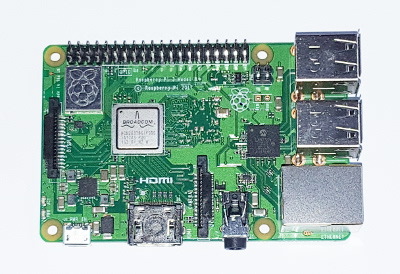 The Raspberry Pi is designed to be connected to a TV, which most people have at home already. I have not included the cost of a TV in either of the prices, but one can be purchased second hand for as little as £20 from BHF Furniture and Electrical stores. The best way to connect to a TV is via a HDMI port. This is only available on recent digital TVs, although those are quite common in homes and students bedrooms today - I've instead used the cost of a composite cable below as that is the better benchmark for those that are less well off. The cable shown on the right costs about £3.50, although the one I bought was cheaper at £2 from DIY store B&Q, and others have reported getting them from a one pound store. Don't be fooled by sales people that insist you need to pay a lot of money for a HDMI cable. I had someone in Curry's suggest that the one I bought from them (a couple of years ago) for £12 was not a "real HDMI cable", and attempted to sell me one costing over £60. The HDMI signal is a digital signal and so a cheap cable will not provide a poorer quality picture than a more expensive cable (which may be the case with analogue signals). For standard HDMI over a reasonable distance (eg. 5m or less) there is no need to spend more than a few pounds. To use an analogue TV then the composite cable is required. This goes from the yellow video out socket on the Raspberry Pi to the TV. Many TVs have composite sockets which the cable can be connected to directly, but for those with SCART only then a SCART adapter is required for the TV end. The SCART adapters typically cost about £2, or can often be found cheaper at the one pound stores (I've not included that in the costs below as it is not normally required). The composite cable (consisting of 3 pairs of wires for the video, audio left and audio right) costs between about £2 and £5. I've used £3.50 for this example. To get the audio through the TV as well as the video then a 3.5mm to phono adapter is required to connect between the audio out on the Raspberry Pi and the red and white leads on the component cable. These are normally available for £1 or less. The one I use came from a computer fair several years ago. I've assumed that the Raspberry Pi will be connected to a TV, but if you do have a digital monitor that could be used instead. Whilst some monitors have a HDMI port, most will have a DVI connection instead. Contrary to some comments you do not need to convert from HDMI to DVI as they are in fact the same electrical signals, but you will need a suitable cable. These cost from about £2.50 each. Clearly these cost much less than the Raspberry Pi (which is contrary to one of the comments from a review I read which encouraged me to write this post). One difference between HDMI and DVI is that DVI does not include audio, so external speakers or similar are required if you want to use audio. Although using DVI to a monitor is preferable many cheaper monitors still have only analogue VGA inputs. In this case it is not possible to connect directly to the monitor as the signal needs to be converted from a digital signal to an analogue signal. Whilst these converters may have been expensive when HDMI was new they are now available for about £15. Please ensure that the one you buy is listed as a converter, active converter or "with chip", and is not just a cable that changes the connector type as some cheaper cables may be. It won't work if it doesn't have the required electronic chip to convert the signal from HDMI to VGA. I bought the one shown here from Amazon marketplace which works fine. This does not support audio from the HDMI port, so external speakers will also be required to connect to the onboard 3.5mm adapter. The items listed above are the ones needed to make the Raspberry Pi work, but there are some other accessories that are useful. Powered USB Hub The Raspberry Pi has only two USB ports that are usually connected to a keyboard and mouse. If you wish to connect anything else then you will instead need to connect to a powered USB hub. This is also a good idea when using any USB device that requires more than a minimal amount of power from the USB port. The hub can also be used to power the Raspberry Pi requiring only a USB to MicroUSB cable instead of the power supply mentioned earlier. Ethernet cable An Ethernet cable is required to connect the Raspberry Pi to a router. These are often supplied with routers so you may have one spare already or can be purchased cheaply. Either CAT-5e or CAT-6 cables can be used. The port is limited to 100Mbps so there is no benefit to using the (usually) more expensive CAT-6 cables. Wireless adapter The Raspberry Pi (model B) includes an onboard wired Ethernet port, but to use with a Wireless network requires a USB adapter. Whilst an old standard the Belkin 802.11g wireless adapter works with the Raspberry Pi and is currently available for about £5. Case The Raspberry Pi is supplied as a bare board without any case. I have not had any problems from normal handling of the Pi and it's fine to leave as it is. If however you would like to protect it with a case then there are several alternatives available from commercial 3rd party cases to make your own. I have created my own Raspberry Pi case (The Raspberry Pirate Chest) which cost just £3.50, plus some paint and glue. Speakers Whilst not required if you are using a TV, external speakers may be required for audio when using a monitor. Any standard audio speaker with a 3.5mm plug should work OK.
Additional storage USB flash drives or external USB disk drives can be connected to the Raspberry Pi to increase the amount of storage. These are not necessary for learning to program, but could be useful if you wanted to create a Media player or similar. Other accessories There are lots of other accessories available (either USB or some for direct connection to the connectors on the Raspberry Pi), that can add additional functionality, but are not required. Assuming you need to buy everything (except for a TV) then the total cost of the additional accessories is £26.50 which is a little less than the cost of the model B. Excluding the items that most pupils / students are likely to have already then the cost of accessories is only about £8. This is still remarkable value for a computer that can be used as an aid to learning IT and programming and many times less than buying a separate desktop computer. * Clicking on the images will link to Amazon.co.uk where you can purchase the accessories. This helps to fund these accessories that I bought to help me to provide this information for free. As some of these links are to Amazon marketplace it may not be exactly the same product that I've tried and tested, so please check the details before ordering.